Remove the stalks from the mushrooms and place them onto a lined oven tray with the stem side facing upwards. Divide the butter into the caps of the mushrooms, season with a pinch of sea salt and sprinkle with thyme. Roast in the oven for 20 minutes, or until the mushrooms are cooked through. Meanwhile place the cous cous into a large bowl and cover with 300ml boiling water. Cover and leave to steam for 5 minutes. Heat 1 tablespoon of the oil in a frying pan and cook the beans with a pinch of sea salt for 3-4 minutes, or until tender. Whisk the lemon juice, lemon zest, honey and remaining oil together. Pour the lemon dressing over the cous cous and toss through the cooked beans and parsley. 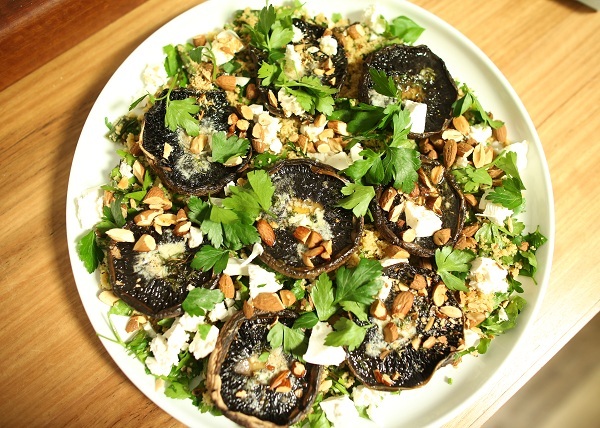 Place the cous cous salad onto the base of a serving platter and top with the roast mushrooms. Garnish with crumbled feta, and almonds. Enjoy!